Onondaga Audubon officers Gene Huggins and Paul Richardson were part of a meeting at Green Lakes State Park to identify ways that Audubon can help the park implement the priorities identified in their Bird Conservation Area management plan. There were also representatives from Audubon New York, Montezuma Audubon Center, New York State Office of Parks and Recreation and Green Lakes State Park in attendance. This initiative is a part of the Audubon in the Parks partnership program. 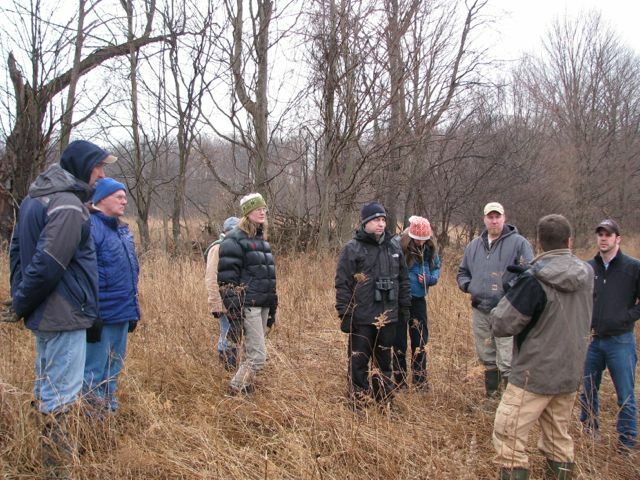 They toured the little visited the abandoned farmland field complex at the west end Green Lakes State Park and were able to get a good sense of the potential and scale of the 400 acre grassland habitat. While the main focus of this initial effort is the grassland habitat, there is also old growth forest in the park’s BCA. There was discussion about ways Onondaga Audubon can assist Green Lakes State Parks with the grassland habitat restoration. Two priorities were discussed. First was to help map and remove invasive plant species. The second would be to monitor birds in the BCA. Both of these priorities allow the park to establish base line data prior to the onset of management activities. There was some discussion of a potential volunteer workday to help map and remove some of these plants. It is likely that a protocol for bird surveys in the grassland area will be set up for this breeding season to acquire baseline data prior to management. Yearly bird population surveys will also be a valuable activity our chapter can lead. If you are interested in learning to identify invasive plants, help with the grassland restoration, and/or monitor bird populations on the Green Lake State Park BCA “Contact” Gene Huggins at gwren70 @ aol .com. Visit this web site for updates on this exciting project – helping to create the largest grassland habitat in any New York State Park! During a breakout session at the Audubon Chapter Leadership Camp in Maine last August, participants from two chapters in the Albany area shared my concern about the declining numbers of grassland birds. 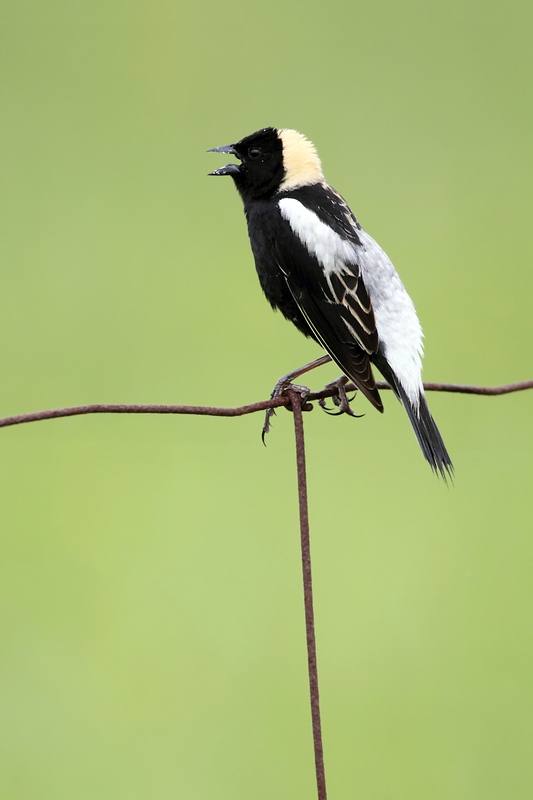 Being inspired by presentations from other groups, we discussed the possibility of developing a project that would help birds like the Bobolink, Eastern Meadowlark, and Savannah Sparrow in our respective regions of New York State. We thought we could share resources and develop a plan together. Because these birds commonly utilize hayfields for nesting, it would seem logical that if we could persuade farmers to implement a bird-friendly haying schedule, that alone could improve breeding success for these birds. I saw these folks again at the Audubon Council meeting this fall and we continued our conversation about what we would like to do. We’d like to develop educational materials about the birds that need this particular habitat and why they are important. We will need to get help surveying our respective target areas and determining if birds are using them. We will need to interview land owners and the farmers who work the fields to see what could convince them to adjust haying schedules to accommodate the birds. Could we get them to add “flush bars” to their equipment to at least save some adult birds? Would a financial incentive be useful? Where might funding be obtained? How could we model the project to fit the guidelines of the AFI to get support from National Audubon? Would something as simple as convincing farmers to delay cutting of bedding hay be meaningful? Could birds be drawn away from prime alfalfa plantings to fields slated for later cutting? We are obviously at the early planning stages of this project. If anyone has ideas they would like to share, please get it touch. You may write to me, Maryanne Adams, at goldtailedhermit@aol.com.